As early as 1949 the RAAF began planning a replacement jet fighter for the locally-built CAC Mustang and DHA Vampire. Successive aircraft under consideration included the Grumman Panther; the proposed CAC large, twin-jet, all-weather CA-23 fighter; and the Hawker P.1081. In the event, Gloster Meteors were obtained in 1951 for service with 77 Squadron in the Korean War. In the same year, plans were finalised for Commonwealth Aircraft Corporation (CAC) to build a locally-redesigned version of the North American F-86F Sabre swept-wing fighter. fitting of the Plessey isopropyl nitrate liquid fuel combustion starter, which allowed the aircraft to start without an external power source. The resultant aircraft, sometimes called the Avon-Sabre, became the best of the numerous Sabre variants built throughout the world. The prototype CAC CA-26 Sabre Mk 30 (A94-101) first flew on 3 August 1953, with an imported Avon engine, piloted by Flight Lieutenant Bill Scott. During a test flight of this aircraft at Avalon Airfield on 21 August 1953, the pilot, Flight Lieutenant Bill Scott, took the aircraft to a height of 42 000 feet (12 800 metres), put it into a dive and at 36 000 feet (11 000 metres) exceeded the sound barrier (at an approximate speed of 1042 kilometres per hour), thus becoming the first aircraft in Australia to exceed the speed of sound. A94-101 went to Aircraft Research and Development Unit (ARDU) in 1955 and in later years resided at Wagga as an instructional airframe; in 1960 it was used for ejection seat trials following three fatal Sabre accidents. 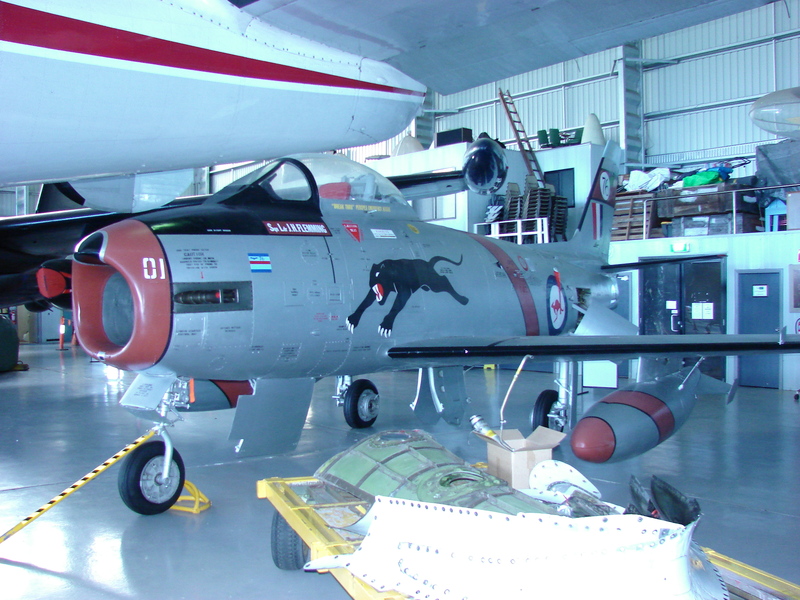 By June 1977, the aircraft had been transferred to Point Cook on account of its historical significance, and was placed on display by the RAAF Museum. A94-351/371. They carried additional drop-tanks and rockets and, from 1960, Sidewinder air-to-air missiles. All earlier Sabres were similarly modified, and retrospectively fitted with the CAC Avon Mk 26 engine which was first installed in A94-973. The last CAC Sabre, A94-371, completed acceptance trials on 19 December 1961. The first production Sabre, A94-901, went to ARDU on 19 August 1954. At some stage A94-901 was modified from a Mk 30 to Mk 31. From 1961 to 1965 it served as part of the Black Panthers Aerobatic Team (76 Sqn). It was due to be converted to componants at the end of 1966, however it survived and was displayed at the Warbirds Aviation Museum in NSW. It then made its way to the CAC factory at Fishermans Bend, were it stood as a ‘gate guardian’ until the late 1990’s when a team from Hawker de Havilland (HdH) dismantled it and transported it to the HdH facility at Bankstown. Restoration was completed and A94-901 is now on display at Albion Park.